Huddie "Leadbelly" Ledbetter Born 1888 - Died 1949 An article about Leadbelly by Paul E. Affeldt. With the appearance in this issue of a review of an instuction manual on how to play 12-string guitar as Leadbelly played it, I`m taking the oppurtunity of changing my feature story and cover photo to honour a man whom I`ve considered one of the greatest in the field ever since i first heard him. In fact, if it weren`t for Leadbelly I doubt very much that I`d even be aware of the real blues. I think that a many of you who are deeply immersed in the miasma of country blues would think back a bit as to where you first introduced to them, you`d find that you too, owe Leadbelly a great debt of thanks. Yet it`s been my experience that the blues purists tend to put Huddie Ledbetter down as a Black Burl Ives, rather than a dominant, drivingly primative artist of more than average accomplishment. It is an amazing fact to me that the majority of the purists in any field look with contempt upon any form of success at all. Had Leadbelly never appeared in concerts and had he never recorded for the Library of Congress the chances are he would be a legend as Blind Lemon Jefferson is today. Indeed, the same is true with Jelly Roll Morton, revered by critic and collector alike, he was able to stage a comeback of sorts before he died and also recorded for the Library of Congress. Whereupon the critics and collectors as a whole turned their backs on him and went off in search of other potted rainbows such as the rumoured cylinder records reputted to have been recorded by Buddy Bolden, or gloated over their Black Patti by Willie Hightower`s Nighthawks. In other words, when an artist finally fights his way out of the sylvan bliss of the poverty and prisons of the deep South and appears in your local night spot in person, or on a concert stage in front of those who`ve been supporting his fight for artistic freedom, he suddenly becomes a Parriah, an outcast. Especially if he appears in decent clothes, master of his instrument and able to do a creditable job on anything more than variations on the traditional 12-bar blues. Somehow I think we all expect to be transported en masse to the deep South behind a cotton gin to sit in with illiterate Negros at a gin-drinking country hoedown, and are a bit put out to find that in most cases our hosts are pretty human after all as well as being musically adept on their instrument. Such illusions have put Brownie McGhee and Sonny Terry in the realm of "pop" singers as far as blues purists are concerned. Huddie Ledbetter was born in Mooringsport, Louisiana in 1888 and raised in Texas. He began in music early and started playing around the Texas-Louisiana area as early as 1903. Besides guitar he also played accordian and some piano. He was jailed for murder in 1918 and served until 1925 when he was pardoned. He worked around the Houston area until 1930 when he again served time, this time for attempted murder. He was released in 1934, and moved east. He went to work as a chauffeur to John A. Lomax, who has done so much to preserve and document American Folk Music. In 1939-40 Leadbelly again served a year in New York prison for assault. 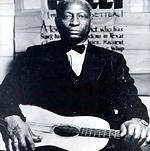 Upon his release Lomax recorded him extensively for the Library of Congress, and Leadbelly began to gain some of the fame he so richly desserved. This was during the "Revival" period of the 40`s and Leadbelly became a fixture in many of the clubs around New York. During this period he also travelled to France for a series of concerts. He recorded extensively for Moses Asch`s various labels and most of this material is still available on Folkways. He also recorded 2 tracks in Capitol`s "History of Jazz" series (one on piano) and a 10` Capitol LP which also featured Paul Mason Howard on zither. Leadbelly died on December 6th, 1949, a powerhouse, a giant of a man, both musically and physically. He left a legacy of music that will serve as his monument.